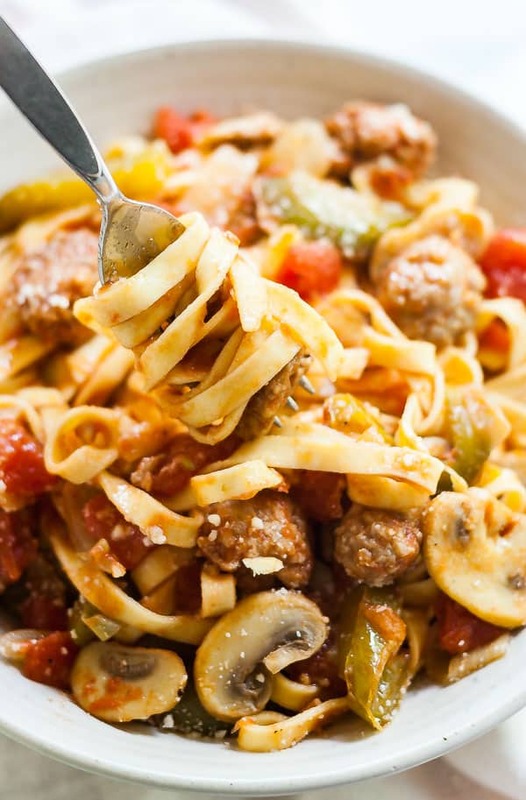 Weeknight dinner should be as quick and easy as it is delicious and this One Pan Baked Italian Sausage and Veggies seriously delivers! Ugh, weeknight meals. Not my fav. I mean, they’re definitely easier now that I’m home, but on the days my girls are at daycare which are typically my shoot days for photos and videos) I’m generally pretty beat by the time dinner rolls around. So after reading all your great responses to my reader survey (you guys are seriously the best!) it became very clear that you guys are a lot like me- you don’t have the time to cook, many of you are lacking in space for cooking and you’re always looking for new ideas! So in an effort to kill a few birds with one stone, I’ve made it my goal to create more one pan meals. Bonus points if they’re quick! This one came about because I had a slew of random leftover veggies from other meals and a package of sweet Italian sausage that I really needed to use. So I figured I should probably create some sort of Italian sausage recipe, and I better hope to it because dinner time was fast approaching! Try to cut the veggies and potatoes to similar sizes so that they that around the same amount of time to cook. The potatoes in this end up cooked and tender, but if you want them to be on the crispier side, you might want to put those on the pan and into the oven for 10-15 minutes before adding everything else to the pan. The seasoning I mentioned is totally a recommendation based on my own taste. DOn’t hesitate to add more or less of something based on your own personal tastes. This would also be excellent meal prep and reheats pretty well. 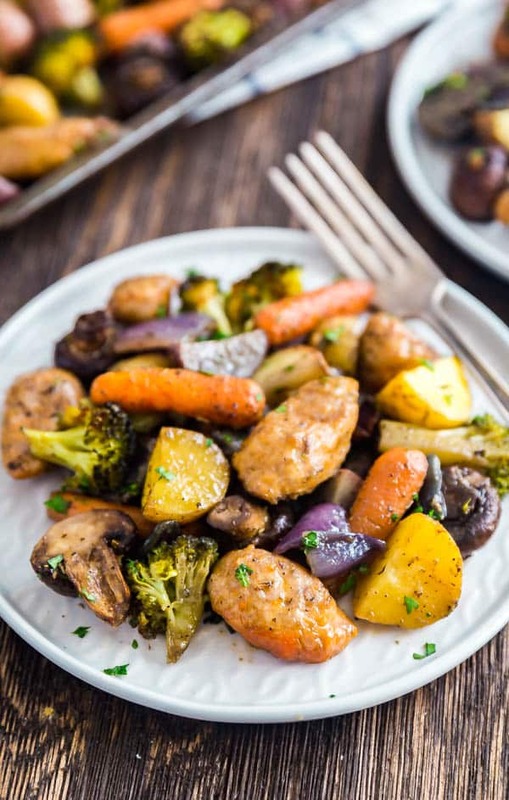 Weeknight dinner should be quick and easy as it is delicious and this One Pan Baked Italian Sausage and Veggies seriously delivers! Add the olive oil, salt, pepper, garlic powder and Italian seasoning to the bowl and toss well to evenly coat all vegetables. 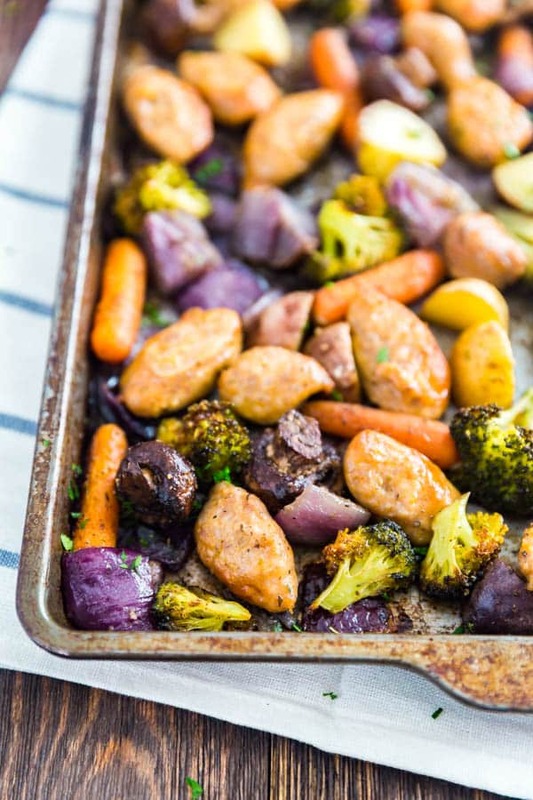 Spread the vegetables onto a sheet pan in one even layer. Distribute the sausage slices throughout the pan. Bake for 30 minutes giving the pan a good shake halfway through to prevent sticking. 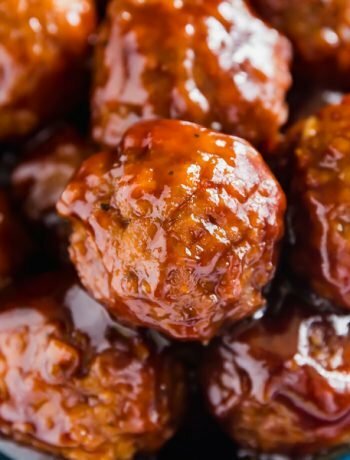 January 23, 2018 at 7:42 pm So easy, so delicious , and so perfect for those nights where I have NO idea what the heck to make for dinner. Looks incredible! January 28, 2018 at 1:02 pm Thank you- I'm a totally fan of throw-together meals like this! February 18, 2018 at 6:43 pm Jessy, you've just given my newly acquired taste for smoked beef sausage another boost! I love nearly all vegetables, so this will definitely be a "keeper" of a SUPER EASY, thank you! recipe. I love that it can all be popped into the oven and cooked all at once--I have almost no kitchen at all, so am constantly trying to find ways to both save space and to prep my meals efficiently--and that it reheats well.